I been meaning to for sometime now write up a post to high light why I write reviews about hosts that appear on webhostingstuff.com’s top 25 list. Mostly because I have hosts that contact me after I do a post and tell me I had no right to do a review on them because I did not use their services. For some reason they either don’t know that I know, or they don’t know themselves that the “advertising” they paid for actually is a bidding contest between other hosts. The proof of why a host is a top host is not there. Data that breaks down the numbers is absent, there are no facts to tell you why one host was better then another. Some of the sites that are on there don’t have any reviews from customers. A few don’t even have a 80% approval from their customers. 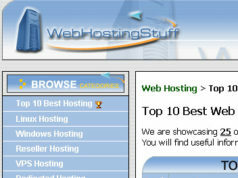 Webhostingstuff.com wants the consumer to take their word for it. I want the consumer to kick the tires so to speak, as a little doubt is a good thing and protects you from a bad deal. While I have lost my original screen shots and email from when I first started the video that gave my site its initial boost of traffic, almost a year of looking at every host that appears on this so called top 25 list gives me the data to prove that the system was rigged. Which at this time is 61 going to 64 hosts this month that appeared on webhostingstuff.com at one point or another in my monthly reviews. So if you are reading this, here is where my right to review any host that appears on webhostingstuff.com top 25. How effective is your “advertising”, if webhostingstuff.com is blocking people from coming to your site? The point of advertising is to get as much exposure as possible right? If you had the choice of a billboard ad on a small town in the middle of no where or a 1 minute ad on some hugely popular reality show which do you choose? It does not take any business guru to tell you which you want. A few months after I started taking snap shots and doing a monthly posts on webhostingstuff.com they started blocking my location. Perhaps in part because I let them know what my provider was. But it not just my location, its been other friends around the world and their communities because they started taking screen shots. It seems to be triggered after as little as one inquiry. Its also been people that have no connection to me at all. Despite their blocking me more people are volunteering to take screen shots for me. So even though they may block someone, someone else is getting through and getting me the screen shots I ask for. But the real question is if they have nothing to hide, then why would they block anyone? The answer to that is their own data shows why you should not choose many of the hosts that appear on their top 25 list. 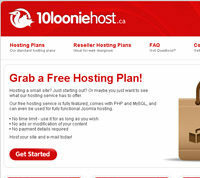 Can you afford to pay a site that blocks people that may be looking for hosting? 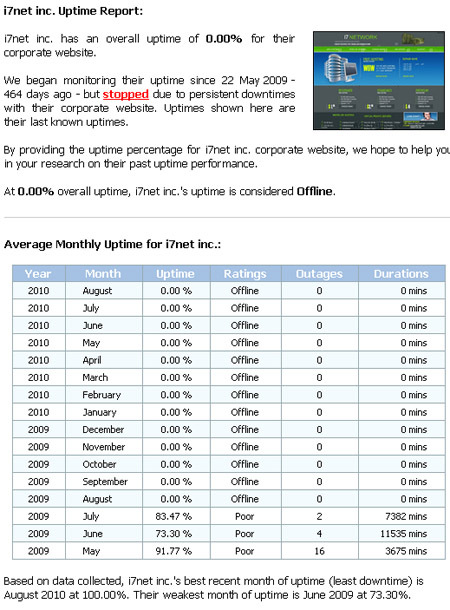 I first found i7net on webhostingstuff.com in June 2010, the problem was it was not even online. Between June to November of 2010 the site appeared between the 21 – 25 spots. Granted those are not the only posts I did on i7net. But if you search webhostingstuff.com you will find nothing. By December 2010, Webhostingstuff.com’s Michel Low must have finale paid attention to my blog because I7net is missing from his data base, well more like deleted from the directory. It seems almost like an attempt to sweep this mistake under the rug and hope that many people did not notice this mistake. It may very well be over looked. Its not like I have huge amounts of traffic coming in (though it increases with time), and truth be told I may be the only one that finds I7net fascinating. Traffic is not that great for the topic i7net, but this is my best argument for not using webhostingstuff.com. I can not help but say that I7net was the dead canary no one bothered to look at while browsing for a host. 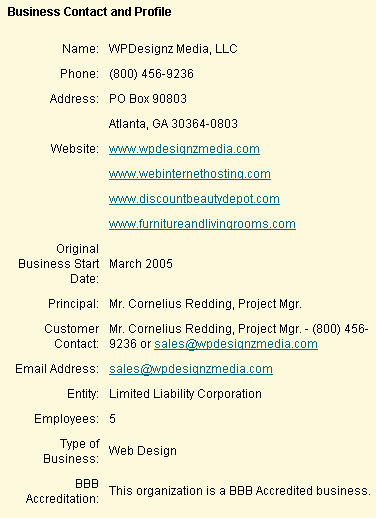 Though while i7net may no longer be in the data base I have screen shots showing that they were indeed there in the top 21 – 25, and that webhostingstuff.com even knew about the down time. This year I made a host mad because I posted the owner’s emails stating “I agree with you the webhostingstuff website is missleading where itsays “top 10..” when its not based on anything apart from there bid.” I did this because even though he knew it was rigged he choose to go back to using it. Later on I would have other hosts such as Corn husker tech that admitted to buying the advertising. I also have another host that while not admitting on my blog he was paying for advertising has admitted to me privately in email while disclosing another review site that operates on “the pay to play concept”. Granted my non-disclosure depends on the fact that I never find that host on another so called review site. But if you choose to contact me via email I reserve the right to post your comments on my blog. The original reviewer asked us to remove their review in writing. Review was found to be inappropriate. 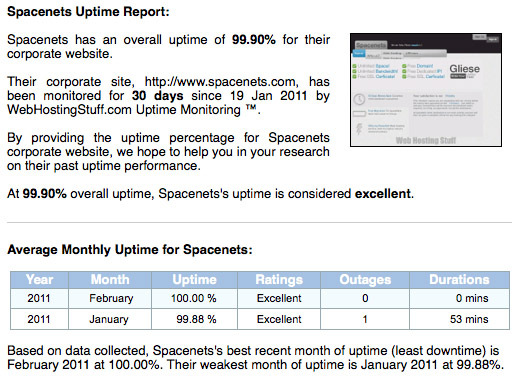 Also “WebHostingStuff takes a firm stance against web hosts that attempt to post fake positive reviews. Enforcement actions include termination of listing and blacklisting on our site.“. Since September 1, 2010 I contacted Michael Low and he of coarse blocked me. This review is still up. Perhaps if this host had been smart enough to not include that site on their BBB record, I would never have found it. You will find hosts out there that have had their positive reviews deleted, hosts that do not pay for the so called “advertising”. Before I go off into ramble here, I want to make it clear that I have no problem with new hosts. Every company had to start some where. There is also the chance that a new host could take the industry by storm, in this market thats always a possibility. One company that comes to mind is justhost.com which did just that, but unfortunately that was one host that got a false start and was even at one point on webhostingstuff.com. Strangely enough they left the webhostingstuff.com top 25 host list after I started the blog with other hosts that are owned by Endurance International Group (Fatcow.com and iPage.com). This is about new hosts that were/are paying for “advertising” with webhostingstuff.com. New hosts which at the time had zero reviews when they first appeared on webhostingstuff.com. 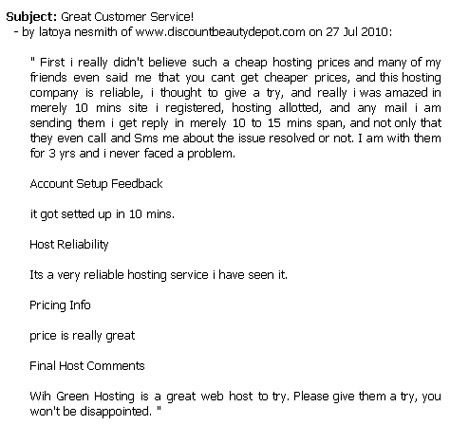 Would you not think customers would have some say in rather a host is good or not? Also would you not think a host would have some time under its belt before being a top host? Considering I recommend no less then 30 days guarantee (you will find me repeating that often). This was a host I found on the top 25 for November 17, 2010, if you look at their whois record you can see the site was up less then 30 days before getting the number 11th spot out of 25. Its a host that offers a 7 day guarantee, which I will never recommend. If a host offers less then 30 days, I suggest avoiding that host. 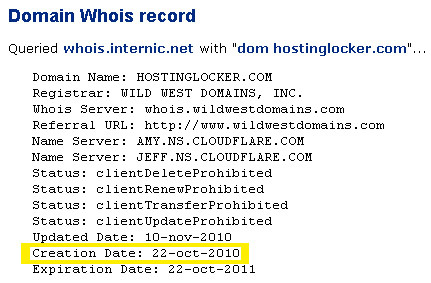 While their whois info says the domain was created July 2010, but webhostingstuff.com indicates that they started keeping track of uptime 12/15/2010. Another host that had been online less then 30 days, for that matter 16 days by the time I did my review on them. Somehow they managed to beat out Siteground who was in the 20th spot, by being in the 13th spot. Worst yet they don’t have a valid phone number. Is that that all that is wrong with webhostingstuff.com? First I have to ask if this host was on the top 25, why was Godaddy.com not on the top 25 list? 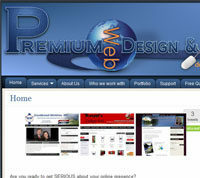 After all this is a Wild West Domains reseller which is owned by godaddy.com. Worst yet it appears this host is putting his customers domains in his name. All I can say is read the reviews from customers on my post, and other review sites. 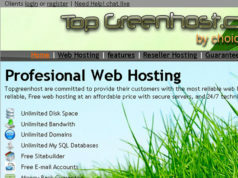 Avahost.com and Siteground.com: Its not hard to be on top, when you own your own fake hosting review site. Both of which own their own so called review site where amazingly they are always the top host with their top 10 sites. The first thing I found was that 5 out of the 9 reviews they show cased on their site were not even hosted with ampheon.co.uk. 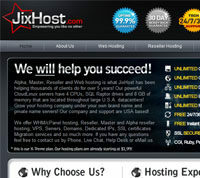 Which can be explained by the fact that only a small area of the main page of the site is dedicated to hosting. There is no direct link to a secure support area on the main page, you have to navigate around the site to find it. This is a company that treats hosting as a secondary operation if even that, which can find out when you read what “out of hours” means. While I may not know how much the pound is compared to the dollar at this time (though I know one pound is more then one dollar) 125 pounds that sound like a lot of money compared to what other hosts would charge, when most do not for 24 / 7 service. So in short trust this site of mine not my other site? Hostaz.com is one of those sites driven by affiliate commissions. 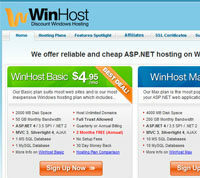 Both Webhostingstuff.com and Hostaz.com are owned by Michael Low. Does webhostingstuff.com delete negative feed back? The answer to that is yes, and I will be pointing the proof in my April 2011 review of which host of the 25 had 2 negative reviews deleted driving its two out of five star rating to a three out of five star rating. Which means I need to start copying feed back of customers which you will see starting this month with my monthly reviews of WHS. Ask yourself, do you really want to do business with a site that fakes your rank? Better yet do you want your company associated with the hosts that I have listed? Webhostingstuff.com is only the first of hosting review sites I plan, and I am already in the works of new methods of digging up the truth. 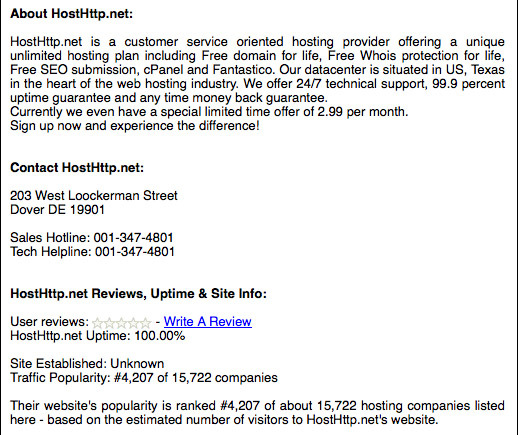 Do you still have to ask why I wrote a review about your hosting company because you appeared on webhostingstuff still?